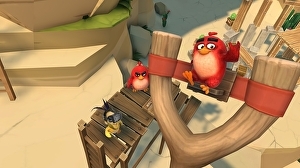 Angry Birds VR: Isle of Pigs is Angry Birds in VR and not much else | Share It Us! In the past, the Angry Birds have spread their wings and hung out in the Star Wars Universe, they've starred in their very own Hollywood movie and they've even opened a theme park or two. That's why it's rather surprising that, aside from some fan made mods and prototypes, Angry Birds VR: Isle of Pigs is the first time the burbs have officially made the jump to VR. So far the game is only available on Vive and Oculus and you can watch me play through a selection of levels from the first two worlds in this week's Ian's VR Corner. Apologies in advance for the singing at the start.